Every year, hundreds of millions of patients around the world die or are considerably affected by heathcare-associated infections acquired during care in hospitals or other healthcare settings. By cleaning their hands, healthcare workers can contribute to reducing the global burden of infection by up to 50 percent. While the burden and causes of health-associated infections largely differ between developed and developing countries, the lack of compliance with hand hygiene by medical practitioners is a general, systemic issue faced by all healthcare facilities worldwide. In 2005, the World Health Organization (WHO) in partnership with the University of Geneva Hospitals (HUG) launched the first Global Patient Safety Challenge, Clean Care is Safer Care. 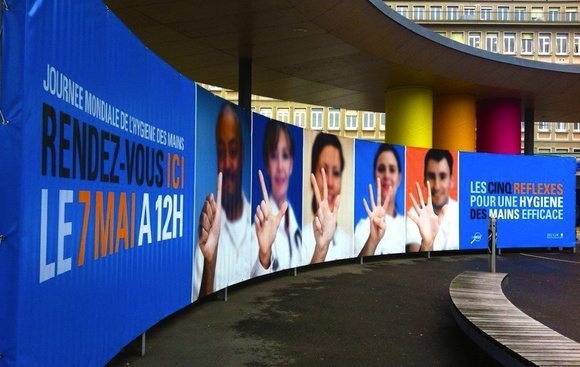 Didier Pittet, Director of the Infection Control Program at the HUG and Faculty of Medicine, led this global campaign to promote hand hygiene in healthcare in both developed and developing countries regardless of the level of development and the availability of resources. This campaign is in line with the United Nations (UN) Millennium Development Goals. A task force of more than 150 medical and public health experts representing WHO member states was formed to draft Guidelines on Hand Hygiene in Health Care. These guidelines provide healthcare workers, hospital managers and health authorities with the best scientific evidence and recommendations to improve practices and reduce heathcare-associated infections. Pilot tests in each of the six WHO regions were conducted to provide local data on resources required to carry out the recommendations and gather information on the feasibility, reliability, and cost-effectiveness of the interventions. Since the launch of the initiative, more than 130 health ministries have pledged commitment to Clean Care is Safer Care, representing over 93 percent of the world population. In addition, over 15,700 healthcare facilities and approximately 9 million healthcare workers in 169 of the 194 UN member states participate each year in the Annual Hand Hygiene Day on 5 May. A range of tools and materials were developed to improve hand hygiene in the field, and WHO experts regularly visit healthcare facilities worldwide to provide support and monitor implementation. Prevention strategies include blood safety, injection safety, sound clinical procedures, as well as water, sanitation and waste management in healthcare facilities. In 2007, WHO CleanHandsNet commenced as an informal network of national, sub-national and regional hand hygiene programs. Regional focal points gather information from areas with large scale activities with the aim of sharing experiences and learning from each other. Innovative campaigns include a Hospital Key Performance Indicator in Malaysia, a web-based training program on hand hygiene in Denmark, an iPAD/iPhone compatible performance monitoring tablet used nationwide in Australia and the local production of alcohol-based hand rub in Mali. Other initiatives such as education and self-assessment tools, media campaigns and the accreditation of healthcare facilities further contribute to reducing infection rates dramatically. The impact of hand hygiene campaigns is particularly significant in low-income countries, where average compliance rose from 51 to 67 percent since the launch of Clean Care is Safer Care. The prevention of healthcare-associated infections has since been placed among the top health priorities in 116 UN states.